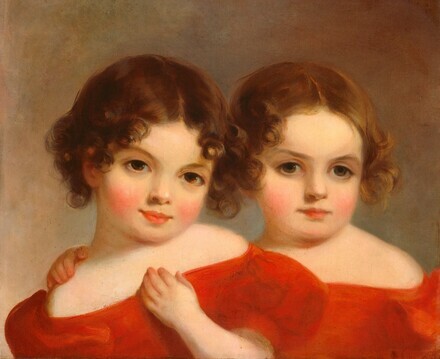 By descent in the sitter's family; Emily Harrison Thorp Whitfield, a descendant of the sitters; by inheritance to her daughter, Mrs. Philip Connors, Middleburg, Virginia; gift 1973 to NGA. Extended loan for use by Ambassador David Abshire, Residence of the U.S. Ambassador to NATO, Brussels, Belgium, 1983-1987. Extended loan for use by Ambassador Alton J. Keel, Jr., Residence of the U.S. Ambassador to NATO, Brussels, Belgium, 1987-1989. Extended loan for use by Ambassador William H. Taft IV, Residence of the U.S. Ambassador to NATO, Brussels, Belgium, 1989-1992. Extended loan for use by Ambassador Reginald Bartholomew, Residence of the U.S. Ambassador to NATO, Brussels, Belgium, 1992-1993. Extended loan for use by Ambassador Robert E. Hunter, Residence of the U.S. Ambassador to NATO, Brussels, Belgium, 1993-1997. Extended loan for use by Ambassador Alexander R. Vershbow, Residence of the U.S. Ambassador to NATO, Brussels, Belgium, 1997-2001. Extended loan for use by Ambassador R. Nicholas Burns, Residence of the U.S. Ambassador to NATO, Brussels, Belgium, 2001-2005. Extended loan for use by Ambassador Victoria Nuland, Residence of the U.S. Ambassador to NATO, Brussels, Belgium, 2005-2008. Extended loan for use by Ambassador Kurt Volker, Residence of the U.S. Ambassador to NATO, Brussels, Belgium, 2008-2009. Extended loan for use by Ambassador Ivo Daalder, Residence of the U.S. Ambassador to NATO, Brussels, Belgium, 2009-2012. American Paintings: An Illustrated Catalogue. National Gallery of Art, Washington, 1980: 242, repro. American Paintings: An Illustrated Catalogue. National Gallery of Art, Washington, 1992: 363, repro. Torchia, Robert Wilson, with Deborah Chotner and Ellen G. Miles. American Paintings of the Nineteenth Century, Part II. The Collections of the National Gallery of Art Systematic Catalogue. Washington, D.C., 1998: 172-173, repro.